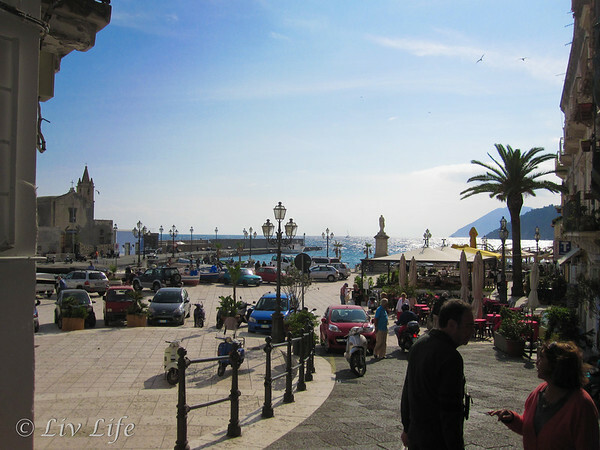 Lipari... it was the one port on our 2011 Legendary Cruise that I was not familiar with. 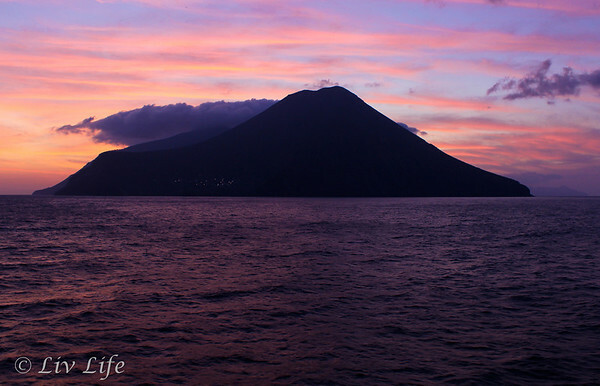 Located in the Tyrrhenian Sea, Lipari is the largest of the Aeolian Islands with a population of a little over 11,000 permanent residents. 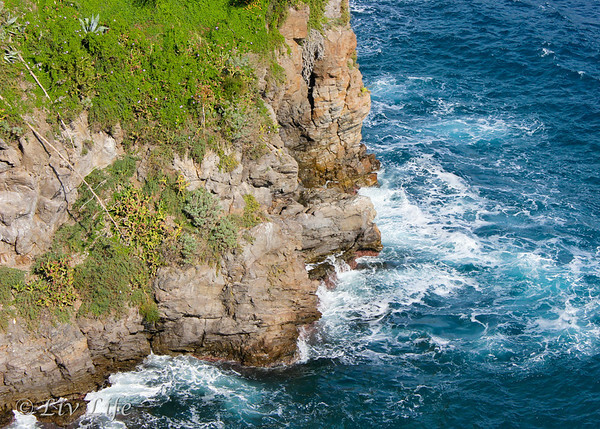 Popular with tourists, the May-September population of this volcanic archipelago swells to over 20,000 with its beaches becoming popular destinations. 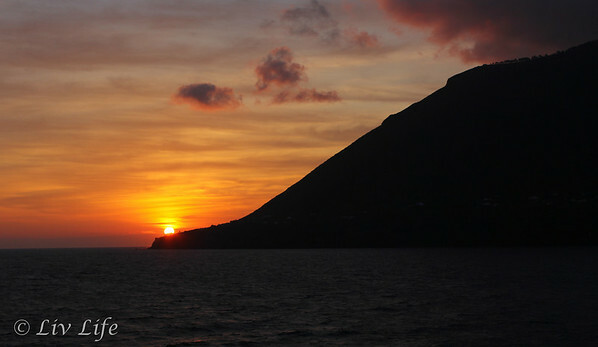 The 5th day of our itinerary began before the sun rose while on our way to the port of Lipari, a scenic cruise through these beautiful Aeolian Islands welcomed the day in style. As our ship entered the archipelago chain at sunrise, this was an entry not to be missed. Greeted by a dazzling pink sky which in turn changed to hues of gold, orange and yellow, my camera shutter happily clicked away for hours capturing image after stunning image as we made our way through the volcanic area. 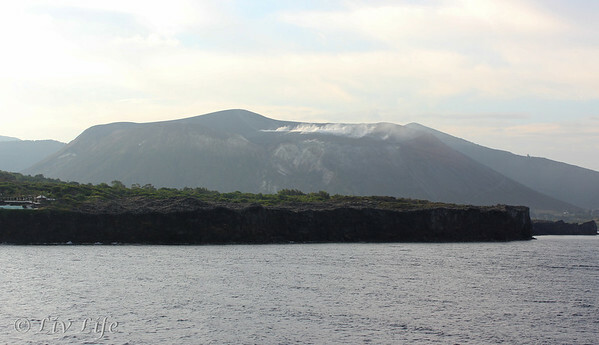 Sailing past multiple volcanic rock formations as well as an actually erupting volcano, aptly named Vulcano, the sights went beyond brilliant. After our morning "tour", the Captain thoughtfully tucked the ship directly under the St. Bartholomew Cathedral and we settled in for breakfast with a view before heading into town. Making our day a leisurely one, we left our ship, the Seabourn Legend, with no direction in mind, and immediately loved the sights of the little fishing village. Fishermen mending their nets greeted us at the port, and cobble stoned streets led from the port area into the main town, itself called Lipari. Shops, cafes and restaurants lined the wending streets providing endless places to stop, and the local men and women just opening their doors greeted us with smiles as we wandered by. Numerous shops filled with locally made pottery had my eye immediately, and Lipari ended up filling the rest of the empty space in my nearly full suitcase. Jewelery made from igneous stones from the island also found its way into my bag as well as around my neck, and I'm still enjoying my morning espresso from my little blue ceramic Lipari cup. Making our way to the St. Bartholomew Cathedral, I expected just another church as we had already viewed so many on the trip. This Cathedral though, took my breath away. Originally built around 1100, the Cathedral was the home of Benedictine Monks for many years before it was burned along with much of the town during a Turk invasion. Rebuilt in the second half of the sixteenth century, the original cloister was converted into a graveyard, and eventually, after a major earthquake it was covered and forgotten. While the remaining Cathedral has undergone numerous renovations over the last few centuries, the original cloister was rediscovered more recently around 1978 and has been restored to its original beauty. 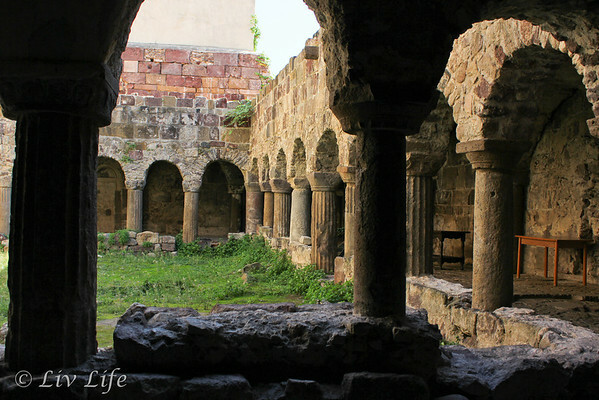 The center garden, enclosed by stone pillars has become a much visited destination for those visiting the Cathedral. 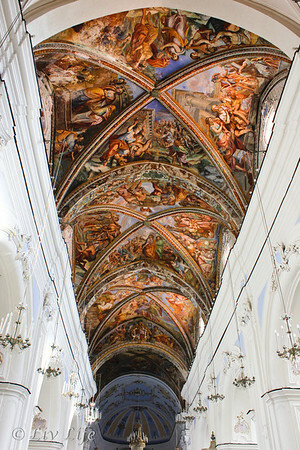 Stepping over rice strewn cobblestones to enter the brilliant white and blue Cathedral itself, the colorful ceiling frescoes depicting biblical scenes date back to the 18th century and had us sighing with awe. Lit beautifully from the side windows allowing so much light to enter the structure, the church is bright and filled with color. 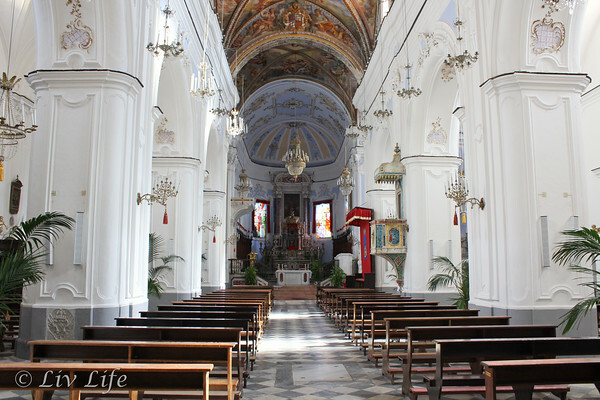 Dedicated to St. Bartholomew, the Cathedral is said to have been the resting place of the Saint after his casket somehow washed up on Lipari's shores. Making our way around the grounds, the views of the blue ocean below and the surrounding town provided stunning vistas and views of the island. 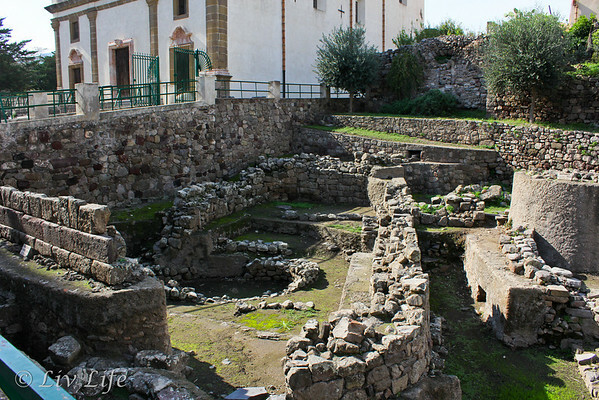 Occasional ruins can be seen around the grounds, and an archaeological museum is nearby. 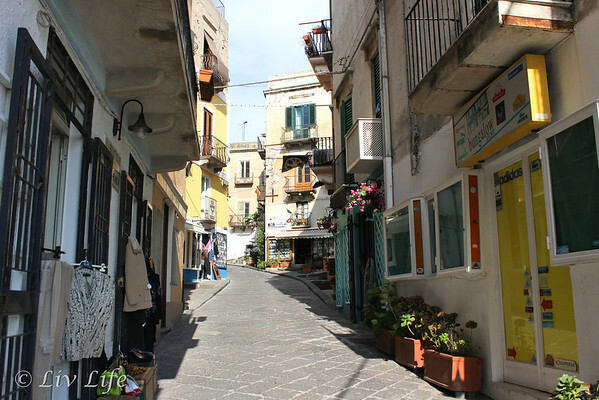 As our time ashore drew to a close, Lipari's charming streets and friendly people left me wishing I had more time. Definitely on my list of places to return to, my day in Lipari and our views of the Aeolian Islands remains unforgettable. Just stunning. You are making me want to go even more. I can't wait for the kid to get out of college and get a job, lol. Hope you have a great rest of the week. I read this post when you first published it but I wasn't able to comment. 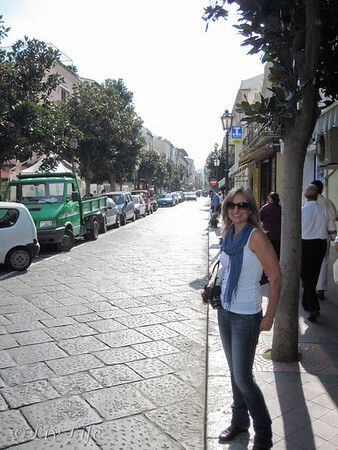 Was waiting for you to share this because I enjoyed Lipari so much when my husband and I visited 7 years ago. 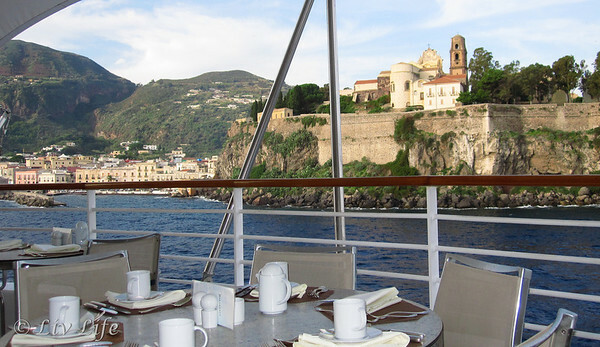 First of all, it's nice to know someone else who's familiar with the Aeolian Islands. Most people don't know where it is.